Cindy is an accomplished jazz singer, hailing from the capitol of jazz - New Orleans, Louisiana. 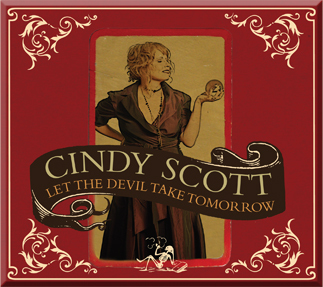 Her second CD "Let The Devil Take Tomorrow" features a collection originals and jazz standards. On this record she leads a smoking hot band that complements her powerful vocal style. The crisp production, courtesy of Brian Seeger (Cindy's guitarist) captures all the magic. Cindy's heartfelt vocal delivery soars above it all and mesmerizes the listener in a way that a truly great jazz singer should. Her delivery is heartfelt, personal and magical at the same time. The original tunes on this CD, "The Boy Can Play", "Let This Love Last", "Start Again" showcase the fact that Cindy is also a talented songwriter, something almost unheard of in this genre where singers usually rely on professional composers. It must be the fact that she is no ordinary jazz singer - she has a Masters in Jazz Studies and also teaches at the University of New Orleans. "The Boy Can Play", one of Cindy's originals, has a great swing feel and a sizzling vocal performance. On "Let This Love Last" Vadim Neselosky (piano) and Geoff Clapp (drums) work some really tasteful jazz magic that takes the song to yet another high. The song "Kiss of Fire" whose lyric lends the album's title is probably the highlight of the disc and my favorite. There really isn't a bad or average tune on this album. Cindy's great voice, the flawless production and an amazing band makes this CD a must for any jazz conossieur. Without a doubt a 5/5.